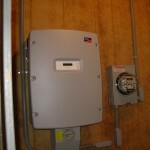 Elizabethtown Solar Project – Nolt Electric, Inc. Solar Energy is always a good idea! 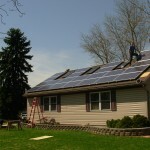 No matter how a property is arranged, there is always a way to install a solar project. 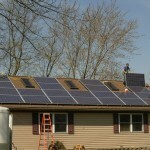 If you want to install solar on a roof, here are a few things to think about. Do I have a roof facing somewhat south? Is there a tree that may shade my roof? What is the age/ life span of my current roof? This property had a detached Garage/ Workshop with less shading and a better orientation than the house. An electrical panel was already present in this building, which was easily accessible. This building allowed us to install a 5kw grid tied system.